Part of being in a consumer driven, capitalist based society is that we as consumers constantly expect and demand bigger and better things in terms of the products that we buy and the services that we use. Companies that are unable to keep up with the ever shifting demands and expectations of the average consumer will quickly find their tardiness severely punished as a rival competitor swoops in and manages to secure a bigger share of the market. The car industry is an especially cut-throat business, with manufacturers always constantly striving to beat their competitors and secure a stronger market position. Whether it is through gimmicks and flash in the plan, cosmetic designs or through the use of innovative and groundbreaking technology, the general rule of thumb for the car manufacturing industry is that change is essential. There have been very few exceptions to this rule, and for a company to rely on the same design of a car is a massive gamble. Either the company has miscalculated its customers loyalty, or is dead certain as to the value of its product. 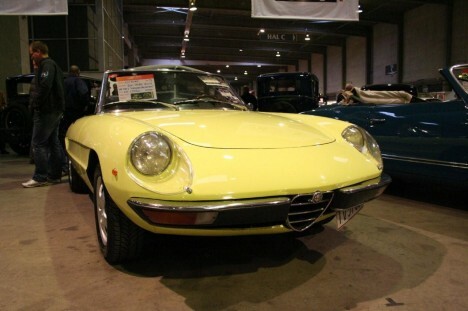 The Alfa Romeo Spider vo was one such car, a car that was a product of love than money. First introduced for sale to the general public in 1966, it enjoyed a reign that spanned the better part of 30 years and in that long time (a length of time which was all but unprecedented for any sports car) very few alterations were made. The Alfa Romeo Spider Duetto managed to prove the exception to years of hard earned cynicism and practical experience of such a dynamic market and the customers simply adored the 1st generation of the Alfa Romeo Spider Duetto. Whilst the majority of consumer products will begin to find that their sales will gradually decrease and taper off, the Alfa Romeo Spider proved yet again, the remarkable exception to the typical rules, with a steady stream of sales throughout its lifespan. The Alfa Romeo Spider Duetto whilst intended to serve as a leading product for the Alfa Romeo company (although to be fair, even they were amazed at the frankly runaway success of the car) was actually based on a less popular vehicle produced by the same company, the Giulia. Only a year after it was released for sale, the Alfa Romeo company decided that it wanted to make some alterations to the Alfa Romeo Spider Duetto, including an upgrade of the engine as well as the steering and handling system of the car, although the changes were reserved solely to the workings of the car. The basic form of the Alfa Romeo Spider Duetto remained the same and were it not for the change of name of the car, from Duetto to 1750 Spider Veloce, the consumer would have been hard pressed to actually identify any changes whatsoever.